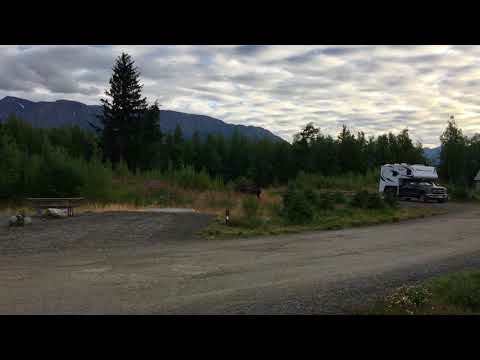 This campground seems to be a very popular one just North if the city of Anchorage. It’s a nice setting but busy! Bathrooms are a hike and we had to essentially share a spot with another group of campers. Ultimately that was okay, but I prefer sites that aren’t so jam packed. Initially I was hesitant about camping here because I had read a lot of bad reviews. There are good sites and there are not such good sites. The location is perfect, the drive down the road was muddy but fine, there was free coffee and although some sites were close together and packed in, others looked perfect! Plus I always enjoy the ability to have a hot shower after a few days of not having one! This seems like a well loved campsite and the lake was beautiful! Lots of sites to choose from and a lot of moose! I’m not sure if it was the free hot shower, the free coffee in the morning, or the sound of sleeping by running water that sold me. Nice stop on the way to Wrangel and great hosts!